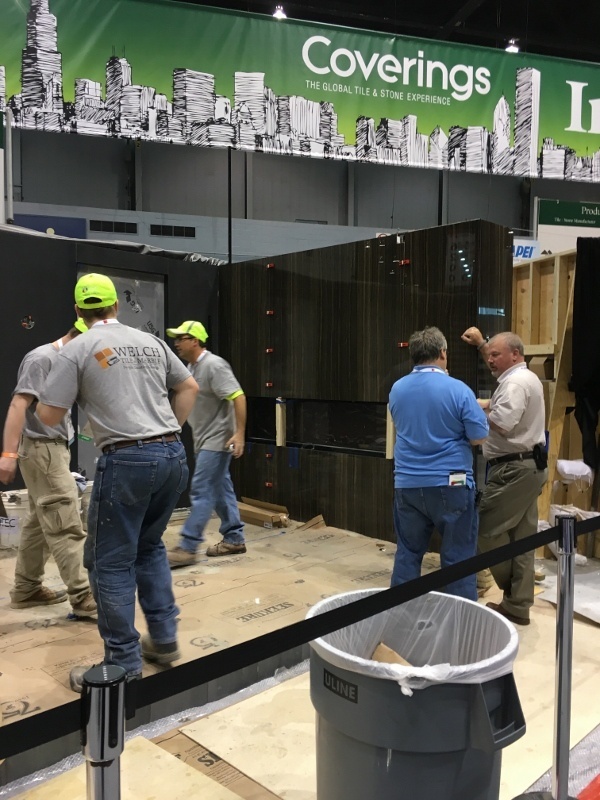 John Cox, President of Cox Tile (pictured in the image above on the far left), is the Technical Consultant to the Coverings Installation Design Showcase. First launched at Coverings 2008, the Installation Design Showcase or IDS features the live installation of tile in several professionally designed vignettes. Although planning and preparation begin several months before the show, the big deal about the IDS is that installation must be completed before the end of the Coverings exhibition, in time for review, admiration, comments and celebration. To say that the experience is intense seriously understates the pressure of having to deal with the unexpected, working around the clock as well as last minute adjustments. 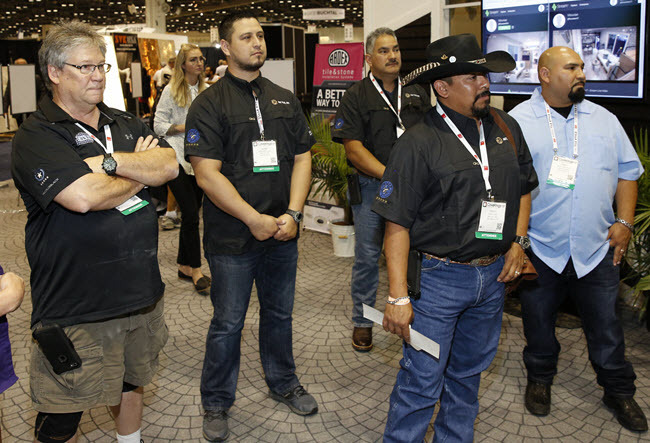 It's a testament to the expertise and commitment of the installers, all of whom are NTCA Five Star Contractors who employ Certified Tile Installers (CTIs), and the designers with whom they collaborate to demonstrate the versatility of tile. Central to the continuing success of the program is John Cox. He, too, is an NTCA Five Star Contractor and a CTI (#1 in Texas!). He participated in the first three IDS, and now plays the critical role of Technical Consultant where he mixes his tile installation technical expertise with his success managing teams and projects, while patiently troubleshooting, monitoring, guiding and more. We caught up with John to learn more about his background, his business and his involvement in the Installation Design Showcase. CTEF: John, what is your background? JC: My father was an ironworker, so I learned about construction at an early age. He taught me how to read blueprints when I was 12 years old. We built a house on some acreage from the ground up. I learned different phases of the construction of a house as we did everything. I was also involved with athletics so hard work, discipline and sacrifice was nothing I had not experienced. CTEF: How did you get involved with tile? JC: I got into tile accidentally. I was looking for a part-time job while I went to college. My mother worked for a homebuilder. I asked her to find out from the trades if someone would hire me part- time; she said the tile guy would give me a shot. It was intriguing building showers, working on floors and countertops. It was hard work but I felt a real sense of accomplishment seeing the finished product. That was 42 years ago. CTEF: How did Cox Tile get started? JC: I worked for the first company for 4 ½ years as an employee/subcontractor and then worked for another company subcontracting work. While working for the first company I had become friends with a builder. He stopped using the company after I left, and called me a lot to give me small jobs that his current tile contractor did not want to do; my scope with him grew larger over the years. This was while I was working for the second company. There was never a conflict of interest as this company did not work with that builder. The workload grew and, being ambitious and eager, I was doing entire houses at night and on weekends. One Sunday he asked why did I not start my own business? I told him that fear and security where the main reasons. He said he had a lot of work coming up and he could keep me and a helper busy all the time. I talked it over with my wife to be, and discussed what was the worst thing that could happen? The entrepreneur in me chose to start my own business. So I put in my two weeks and started Cox Tile. CTEF: What do you love most about tile? JC: The whole process -- employees, relationships, creativity and the finished product. We are in the relationship business. Homeowners, designers and architects all require different knowledge as well as skill in communicating with and educating them about tile. Same with employees. It is fun seeing them grow from inexperienced to skilled craftsman. I have always focused on doing the most difficult and challenging jobs. The rewards are much higher and the clientele is willing to pay more for this type of work. It is fulfilling to see the finished product and the happiness of the homeowner and then receiving a check for the completed work. It does not get much better than that. CTEF: How did you get involved in the Coverings Installation Design Showcase (IDS)? JC: Bart Bettiga from the National Tile Contractors Association (NTCA) asked me (Cox Tile), Nyle Wadford (Neuse Tile), James Woelfel (Artcraft Tile) and Dan Welch (Welch Tile) if we would help with the first IDS installation in 2008. It was a new concept to Coverings and we were the first guinea pigs. We subsequently worked on the next two IDS for a total of three. CTEF: What is your role in the IDS and how has it evolved? JC: My role has been a consultant and organizer of all the participants involved with the IDS. 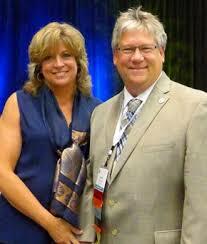 I was humbled when Bart and Elena Grant from Coverings asked me to help with the showcase. I guess they recognized my ability to work and schedule the many pieces involved with the IDS. Every year is always a new challenge with different participants and new concepts. Remember the relationship business I described earlier? Same applies for the showcase. I have been fortunate to understand the whole process thanks to my upbringing and exposure to homebuilding. Bart and Elena trust me to make sure it happens. It is a process with challenges all along the way and thank goodness nothing has been insurmountable. It has been very fulfilling dealing with the many participants. Each year brings a new challenge. CTEF: What have been the biggest challenges you’ve seen during the IDS? JC: The biggest challenges seem to be on the first day getting everything in order. 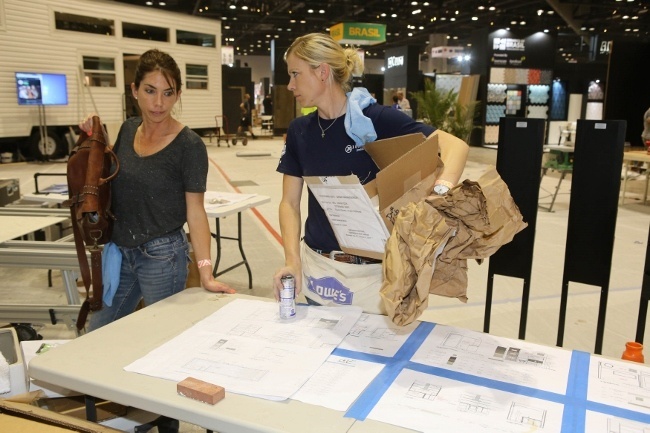 If you have ever been to Coverings while it is being put together, it is organized chaos at its very best. Trying to get all of the puzzle pieces together and in the right location is definitely challenging. The mental and physical requirements for those participating in the IDS starts 4 -5 months in advance. That’s when the planning begins. CTEF: And the biggest surprises? JC: Finding everything the first day so everyone can start with what they need and ordered. There are a few French words uttered during this process. Good thing I am bilingual. 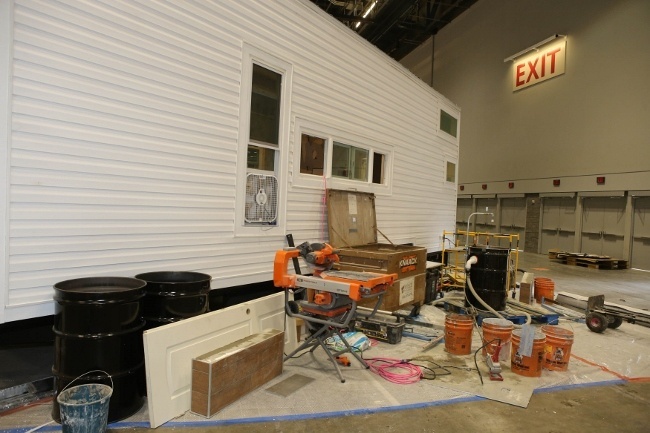 CTEF: How were the Tiny Houses of the 2017 Installation Design Showcase different compared to previous showcases? JC: Before the Tiny Houses, each installation-design team had a space and particular theme they were tasked to do. The spaces were 10’ x 20’ with wall heights being 8’ with some partitions. With the Tiny Homes the whole interior of the house was tiled, floors and walls. The only area not tiled was the ceilings. The homes were 8.5’ x 31’ with wall heights being up to 12’. There was more surface area to tile. They have all been a challenge to start and complete with the amount of work to be done in the time frame we have to work with. The concept has always been a tile installation work in progress for the audience to see and visualize from the very start to completion. 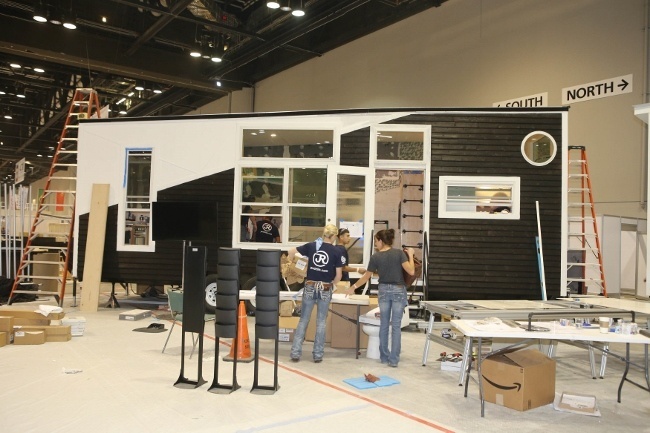 CTEF: What advice do you have for designers and installers participating in the IDS? JC: Once the teams are chosen for the project, I spend a lot of time preparing them mentally and physically for the tasks they will be partaking in. It is grueling at times with the short time frame we have to get the installations completed. These conversations take place on conference calls with all the participants. We try to make sure they and their teams are well aware of the time and energy their teams will utilize to completion. We also have a breakfast that we encourage everyone to attend at 6:00 am the day we start so there are no details or questions left out. I kid around with the installation crews about having a black curtain to put over their project should they not finish. Thank goodness the curtain has never been needed for someone who did not complete the showcase. Close but no cigar! For the designers, I ask them to be on site as much as possible to answer the many questions that arise due to unforeseen circumstances. They are part of the teams and the installation crews work harder and more efficiently when the designers are there. Remember the success of each showcase truly is a team effort. It has been rewarding getting to know the many different people associated with the showcase. They all have become lifelong friends. There is a great sense of appreciation (and pride) in seeing them shine in the limelight. CTEF: Why do you think the Certified Tile Installer (CTI) program is important? JC: The CTI program is important for many reasons. There is a lack of professionalism in the tile installation trade and having a certification validates an installer's ability to install tile correctly as per ANSI and TCNA standards. It helps validate a company, that they are doing everything they can in installing tile correctly. It builds confidence, knowledge and pride with the tile setter. The CTI hands-on test is a challenging test, not to be taken lightly. You must have acquired the setting skills or you will struggle and possibly not pass the test. It has been humbling to most who do take it even if they pass. It also provides assurance to the homeowner, builder, designer or architect that they are hiring the right person for the task at hand. There are a lot of good tile setters who may not choose to become a CTI. It does not mean that they are a less skilled; that’s their choice. However, an end user who chooses companies that employ CTIs is the recipient of the most advanced training for their tile installation project. CTEF: John, how can readers contact you? JC: The best way to reach me is through email at john@coxtile.com. I am in and out of the office, so sometimes calling the office is a hit or miss in reaching me. If someone wants to leave a message my office number is 210-340-1122. I love tile and talking about tile, so I am an email or phone call away from a conversation. To put into perspective the intensity of the Installation Design Showcase, here is a 4:25 minute video about the Tiny House version of the program. Coverings 2017 IDS Video - Full from PrimeImage Media on Vimeo. Ready to Become a Certified Tile Installer? Do you have questions about becoming a Certified Tile Installer as John Cox is? Let us know in the comments.